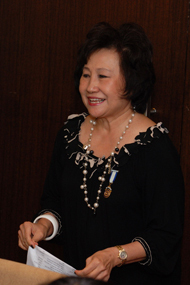 Lucia Goh was installed on 23rd June as the 38th President. The simple ceremony was held at the University Club at Kent Ridge. Gracing the occasion was IIW Board member and District ISO Mrs. Shirin Ghadiali, incoming President of IWC Singapore Mrs Smita Gadgil. Also present were IWC Singapore East Past President Rajani and fellow member Nelly Doctor. MC Dr Kim Ng was eloquent and humorous, and kept us engaged all the time. In addition, she exhibited her own collection of photographs of the past events for the occasion. She even compiled and banded a members' list, President, Secretary and Treasurer's reports and distributed to all those present. As the theme "Memory of Yesteryear" goes, all members turned up in fashions of the sixties and seventies. Paul Sie and Joanna wowed the crowd with their most unusual outfits: he with a leather jacket and dark glasses, topped with a wig that made him look like a rock star; and she in an a-go-go style mini skirt. Eventually, the pair walked away with the top prize of being the best dressed. Another winner was Sophia. At the end of the celebration, Mr Lee, Tommy Lien and Dr Goh bought the floral arrangements personally made and contributed by Vice President Rose Lien and added $150 dollars to the sunshine box.